My life changed when I was 21 and had my first panic attack. I was thinking about how I always got excited about starting a new position, mastering my role, and enjoying lots of praise from my bosses, but consistently wound up feeling bored and miserable. As I was dragging my feet on my way to my corporate job, I realized I couldn’t do this anymore. This discovery was liberating. . .for a few minutes. Then, a single thought made my heart pound wildly and my stomach tie itself up in knots. That’s what threw me into a panic. The idea of starting my own business never even crossed my mind. In the USSR (where I grew up), entrepreneurship wasn’t promoted. Everybody I knew slaved away at their jobs and followed government guidelines. I felt sick to my stomach when I envisioned myself living this way any longer. So I took advantage of the first opportunity I had to leave the former USSR and create a new life for myself. Eventually, I started SystemsRock—my very own business. Now, I help small business owners achieve systematic success by optimizing their daily routines so that they can make more money and focus on high-leverage projects that increase their bottom lines. Running a business is not always a smooth sailing, but I’d never return to a 9-to-5 position. I’m assuming, you feel the same way! I’m also assuming that as you’re looking ahead to 2014, you’re thinking about how you can make it a year where you exceed your goals and once again prove that striking out on your own was the right decision. So let’s zero in on how you can make this happen! What are the highlights of the year? Did you. . .
Have your first 4-figure month? Launch a product that’s been selling incredibly well? Land an interview with a person whose work you admire? Train your clients not to bother you on weekends? Write a post that truly resonated with your audience? Stop for a second and pat yourself on the back! Acknowledge yourself! Celebrate your accomplishments. Say a little gratitude prayer for what you’ve accomplished. What lessons have you learned? Did you. . .
Buy too many courses and find yourself without the time to implement the trainings? Neglect your own needs for the sake of your business? Use your e-mail inbox as your to-do list? Lose money on hiring someone who wasn’t the right fit for the project? Got your list? Now, let go of your fiascos. We all make mistakes. Some of them are more costly than others. But that’s the most effective way to learn. Be grateful for your mistakes as well. How do you want your days to look like? Where do you want to be financially? What other milestones do you want to achieve? How do you want to feel while working in and on your business? When answering these questions, make sure that your goals make you feel slightly uncomfortable and pleasantly nervous. You should feel that reaching these goals will be a bit of a stretch. If your goals make you feel relaxed, go back to the drawing board and take them to the next level. If your goals are too unrealistic, bring them down a notch. I’m all for being ambitious, but if the goals feel entirely out of reach, you will quickly lose your motivation to reach them. How much time do you want to spend working on your business? What are your exact financial goals? How can you break down the target milestones to make them feel doable? What courses do you need to take to get better at necessary skills? Where do you need to get more disciplined to make it all happen? Take each of the goals on this list, determine the steps you need to take to achieve them, and work these steps into your daily routine. I purposely started the list with how much time you want/can spend on your business. This is key. You’ve got to be realistic about how much time a week you can work. Make sure that you calculate in the time you have to be committing to other responsibilities—your wellbeing, family and children, etc. Only once your clear about your time should you proceed with the rest of the steps. When looking at financials, break down your projected profits by different income streams. Then, divide them by the number of months or weeks so that you know your target numbers. Don’t forget to take into account your estimated expenses. When planning your milestones, look at the offerings you want to launch, traffic numbers to hit, relationships to establish, etc. That might require you to learn new things or examine and test new tactics. Make sure to set aside time for topics you want to study. Don’t overdo it, though! Lastly, don’t forget to set a goal of how you want to feel working on your business. I know firsthand that freedom doesn’t come the moment we start our business. However, if you know what level of freedom you are building for yourself, it will drive you to create routines in your business that support that vision. Make your calendar your best friend this year. It can be a big wall calendar, an online calendar, or a Moleskin planner. To reach your goals, you’ve got to physically create your year on paper or digitally. It’s important to set aside time to regularly analyze if you are on target. For yearly goals, a quarterly review is sufficient. Just make sure that you keep yourself on track throughout the quarter. Monthly or weekly check-ins are great for that. If you have an assistant, feel free to do the reviews with them. Commit to making the new year about the routines—routines for your everyday and routines for stepping in your role as visionary manager of your growing empire. 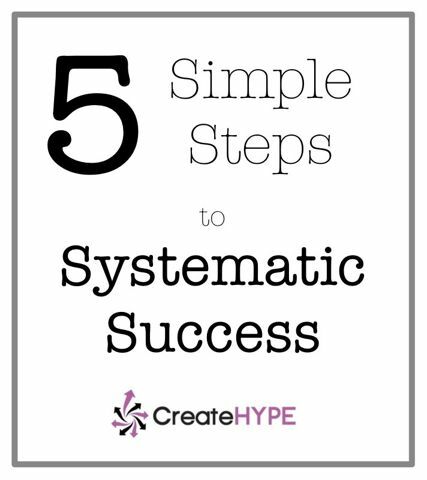 Success will become an integral part of your system if you optimize these routines. I’m wondering… How do you want to feel as you’re working on your business in 2014?